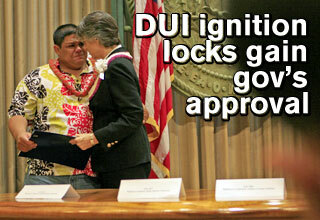 Kekai Seabury, whose father was killed in 2003 by a drunken driver, cried yesterday while receiving a signed copy of the Ignition Lock Bill from Gov. Linda Lingle. The increased cost of shipping has the local carrier raising its fee. Specifically prohibited is the "unauthorized occupation" of Iolani Palace and other buildings on the grounds. A drug case puts more time on the term of an off-duty sheriff's killer. Steve Oshiro is suing Roberts and wants his plea withdrawn. Police seek help identifying a man using an ATM in Kaneohe. Shriners aims to raise about $5M as construction nears completion. Both All-Americans represent a historic breakthrough for the Hawaii program. Just a month ago, it cost 35 cents less a gallon for regular, self-serve. A yearly study indicates that welfare of Hawaii's children ranks 13th among states.